To make the point about resolution without going into a lot of technical detail, here’s another visual example. The two images below are similar views of Laguna Blanca in Santa Barbara, taken on different days with somewhat different light. The first one is a crop from a single frame showing the full width of the lake taken with a wide-angle lens. Some of the foreground trees and background sky have been cropped out. The second image is a similar view from part of a panograph made with eight vertical full-frame captures taken with a medium-telephoto lens. These eight frames were balanced for tone and color in Lightroom and then seamlessly blended together in Photoshop.Though the light is different and the second image seems a little sharper, they both are presentable. When I first started to finish images for display I used a traditional approach with professional-looking gallery frames and mats with UV-filtering glass. After while I became intrigued with the idea of “float” frames where the image appeared to float in space inside a sort of shadow box with UV-filtering acrylic to protect the print. I had a small show at a local gallery with eight images from Death Valley National Park (now part of the Death Valley collection), and this was one of them. 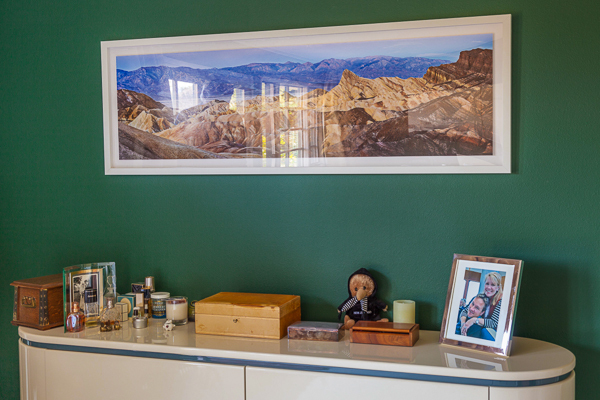 And this is a photo of the same scene with the new, “glassless” print. See how the reflections are gone? Also look at the right side of the two images. See how much more presence there is in the glassless version? Even though it’s less obvious, the glazing picks up reflections from everything in the room and diffuses the light coming off the print. It seems to me an unframed print is unfinished. If you buy a poster, OK. But I think fine art of any kind should be finished, ready to hang and enjoy. I doubt any painter would want to sell an unframed canvas. I think they look better. Everything I try to do with my work is maximize visual impact, and so far I’ve yet to find an image that looks better with a mat, a wider frame profile and glass. At the first gallery show I did with glassless framing (the En Plein Air collection), people asked, “What are these? Photographs? They look like paintings.” That’s when I knew I was on the right track.